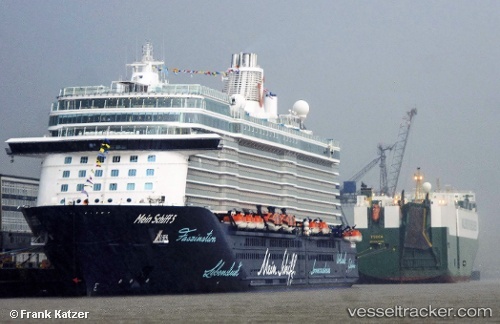 The "Mein Schiff 5“ berthed earlier as scheduled at the Columbus Quay in Bremerhaven. Instead of July 31 morning it arrived on July 30 at 10.50 p.m. for a medevac. While the patient was dropped off for medical treatment ashore, the passengers could leave the ship as scheduled on July 31 at 5.30 a.m. In the morning of July 14, 2016, Federal Police officers were waiting for the arrival of the "Mein Schiff 5" in Kiel to arrest a crew member. The 28-year-old had been sentenced to a probation of one year and 3 months for fraud in Bavaria. Since the man repeatedly had violated against the probation, an arrest warrant was issued for preventive detention. The 28 year old man was brought to a judge which telephoned several times with the Bavarian court that had issued the arrest warrant, and the 28-year-old was given the opportunity to express his views by phone. It could be achieved that the security warrant was transformed into an executory arrest warrant. The sum to be paid was set at 1,040 Euros, payable immediately. After the young man had paid the amount at the federal police he could, after intensive discussions with his employer, keep his job.